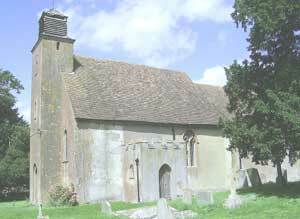 The church at Badlesmere is dedicated to St.Leonard. There was a church at Badlesmere in Kent when the Domesday Book was written in 1085, it being noted "there is a church and a fishery of twelve pence", but as there is no water here it probably means that the Manor had fishing rights elsewhere. The existing building is of thirteenth-century origin although the external rendering is typical of the early nineteenth century and gives it a Georgian appearance. It was during the reign of Edward II that the name Badlesmere was famous throughout the land when the king heaped riches and honours, including the governorship of Leeds Castle, on Bartholomew de Badlesmere and made him a great favourite at court. The coat-of-arms of this wealthy Baron are still to be seen in the Cloisters of Canterbury Cathedral (a silver fess and two gemel bars gules). He eventually fell out of favour with his monarch due to an incident where Lady Badlesmere, in her lord's absence refused to lower the drawbridge of Leeds Castle to Queen Isabella, resulting in Bartholomew's beheading at Canterbury in 1322.
in memory of one Lady Barbara Wrythe, whose husband was Garter King at Arms. This lady who died in 1485 was a direct descendant of Bartholomew de Badlesmere's through his grand-daughter and probably inherited his Kentish property. John Betjeman in his "English Parish Churches" says that Badlesmere Church has a complete 18th century interior of rare beauty. He goes on to say "The walls and choir stalls are older, and this may account for one's feeling that this church is best because the most varied of its kind in the county". Interior of Badlesmere Church Details of he pew ends in the chancel near the altar which have been there since 1415. 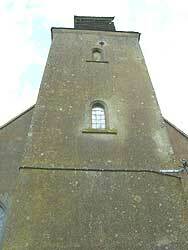 The western tower is small and has a wooden turret with louvres containing one bell which was brought from Reculver old church in 1830 when it was dismantled. It is recorded that this bell whose inscription reads "Joseph Hatch made me in 1635" was bought by Badlesmere Church with two other bells which were later sold to provide funds to repair the fabric. Joseph Hatch was a bell-founder who lived at Ulcombe near Maidstone, and his bells still ring out from numerous churches in Kent. Restored by the Whitechapel Bell Foundry, the bell was rehung on 20th July ,1987. Stained glass windows at Badlesmere Church Western Tower with wooden louvres containing one bell brought from Reculver old church in 1830. South entrance of Badlesmere Church, now used as a vestry. The south entrance is now used as a vestry and there was formerly a small chapel also on the south side of the church, but it fell into ruins over two hundred years ago. Hasted records that in his time, 1770, the foundations could be seen with tombs of several members of the Badlesmere family, but there is now no trace of this chapel. On entering the church one is struck by its height and narrowness and it now consists only of a nave and chancel, the chancel-arch having been removed. It keeps its old-world appearance with the box-pews and high two-decker pulpit, the roof being the original 14th century with tall slender king-posts and fine heavy tie beams which are moulded underneath. The Royal coat-of-arms over the west door are dated 1717 which was early in the reign of George I (1714-1727) and are a fine example of that period. They have recently been restored by A. Goulden, Esq., of Woodnesboro', who is an authority on Heraldry and who states that the artist concerned eas not too sure of his subject because in the Hanovarian quarter of the Arms of Scotland (a red lion on a gold field within a red border) have been used instead of the Arms of Denmark (a blue lion on a gold field covered with red hearts). The two lancets of plain glass over the altar are of the early 13th century and are unusual as three in number are more common. The windows on the north and south sides are good specimens of Early Enlish lancets with hoods and the small windows in the vestry contain fragments of ancient glass. The glazing bars in the windows, the leading creating intersections at the top, are Georgian. Frederick W. Cole designed the two west windows depicting St.Francis of Asisi and the Sower. The windows were dedicated in 1990 to the memory of Margaret Thomas Scutt, churchwarden, neighbour and true friend to the Church. Other examples of Cole's work are the Mary Magdalen in the GArden window and the heraldic Harris family window in Throwley Church, and sixty-three designs for the Mashpee Roman Catholic Church, Massachusetts. The font stands in a recess which was once a doorway, the outlines of which can clearly be seen on the outside, and is a plain octagonal on a stem with cylindrical mouldings. The wooden reredos is of considerable age and is surrounded by an elaborately carved finial. 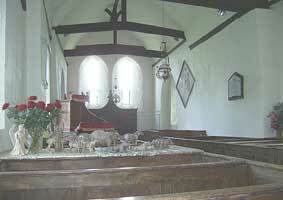 The pew ends in the chancel near the altar have been there since 1415. They are elaborate in desigh and beautifully executed. On the inner face of one can be raced the words "Sancte Peonardex" and "Ora Pro Nobis" and on the other side "Sainte Maria". 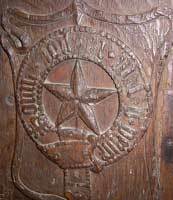 On the standard is the shield with the device of the Trinity and the lower part of each bench is filled with linen-fold carving. The letters Eleventh Earl of Oxford and Badlesmere who was made Knight of the Garter by Henry V and this fits in with the date 1415. The church plate is kept in the bank and consists of one silver chalice made in the reign of Elizabeth I and dated 1574 and two silver patens which have hall-marks of the year 1736. As in that year the Patron of the living, the Rt.Hon.Lewis Watson, 3rd Earl of Rockingham was married, it has been suggested that he donated the patens to the church then. The hatchment on the south wall is of George Watson, the First Earl Sondes who died in 1894 and was married in 1859 to Charlotte, the eldest daughter of Sir Henry Stracey of Norfolk. It was the custom to paint armorial bearing on a lozenge-shaped panel and display it on the housefront as a sign of mourning. Oftern such hatchments, or funeral escutcheons, were placed later in the parish church. Here the black background on the dexter side and the whihte on the sinister indicate that the husband had died and the wife survived him. The Altar Frontal was designed and made by Margaret Marsh, the wife of the former rector, and given to the church in memory of the late Earl Sondes who was the Patron of the living and the late Lady Sondes by their relatives. Under one of the yew trees outside is an old churchyard cross made of Bethersden marble. These crosses dominated the churchyards before the Reformation and were the only memorials to the dead in the days before gravestones. The oldest tombstone has on it a scull and cross-bones and an hour glass, and is "To the memory of Thos.Weldeth who died in 1679 aged about 80 and Hester the wife of by whome he had issue 7 sones and one daughter". So, he was born in 1599. Old wills disclose many odd items and we find that in connection with Badlesmere several people left corn to be sold for the purpose of maintaining lights in the rood loft, and others left sheep to be sold for the upkeep of lights. A widow named Joan Broomfield died in 1505 and left to the church "a little awter canflestick of laton and a taper of wax thereupon and 20s. 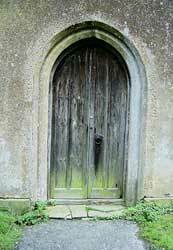 to be maintained by the churchwarden there and burnt before St.Leonard for evermore". Sources for these notes are from a leaflet of St. Leonard's Church, Badlesmere that attribute sources as: Grayling, Churches of Kent; S.R.Glynne, Notes on the Churches of Kent; A.Hussey, Notes on the churches in the Counties of Kent, Surrey and Sussex; C.Igglesden, A Saunter Through Kent; MArk Charfield, Churches the Victorians Forgot, Moorland Publishing, 1989.